Inserting text passages and links through the clipboard is very practical; however Word automatically formats text, which can be annoying. The best thing to do is just paste the text without any formatting. Depending on the contents of the Clipboard, Word offers diff erent options for the formatting of an inserted text passage. Open the Tab 'Home', and click the arrow under the 'Paste' from the 'Clipboard' section. Then select the required option from the Paste Special Dialog box. When you copy from other programs, Word uses the destination formatting. You can make it a standard process to paste just the text by changing the default settings. To do this, click the 'Office Button' and then 'Word Options'. Select 'Advanced' and look for the 'Cut, Copy and Paste'. In Combo-field 'Paste from other Programs' change the setting to 'Keep text only'. Click OK to save changes. 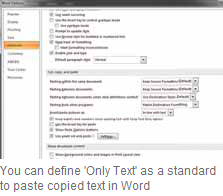 Using a combination of other fields, you also control the setting when pasting from within Word documents.